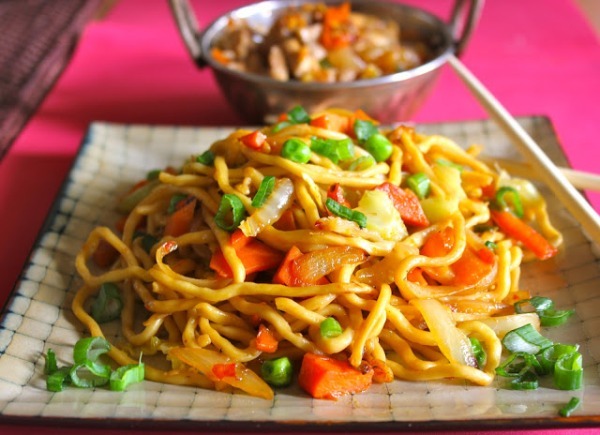 An easy and quick noodles recipe with complete health advantage. Addition of chicken is depend on your choice, it goes great without chicken as well. if you have leftover meat add in noodles. Heat oil in a pan, stir fry carrot and capsicum, and then add salt, red chili powder, green chilies, chili sauce, soya sauce and water. Cook until vegetables get soft. Add peas and chicken, cook for 3 minutes and add noodles. Cook 2 minutes more. Dish out and serve with ketchup.